Immediately on leaving Bristol, he went over to France, with a view of prosecuting his studies in privacy; and practised a very rigid frugality, for the sake of maintaining his independency unimpaired. During his retreat there, first at Rheims, but chiefly at L& Fleche, in Anjou, he composed his “Treatise of Human Nature;” and, coming over to London in 1737, he published it the year after. This work, he informs us, he meditated even while at the university; a circumstance which, it has been observed, proves the self-sufficiency of Hume in a very striking manner. For a youth, in the full tide of blood and generous sympathy, to meditate the diffusion of a system of universal scepticism, in which it is endeavoured to prove, not only that all the speculations of the philosopher or the divine, but every virtuous feeling of the heart, every endearing tie by which man is bound to man, are no better than ridiculous prejudices and empty dreams, is the most singular deviation from the natural and laudable propensities of a mind unhacknied in the ways of the world, that has yet occurred in the anomalous history of man. 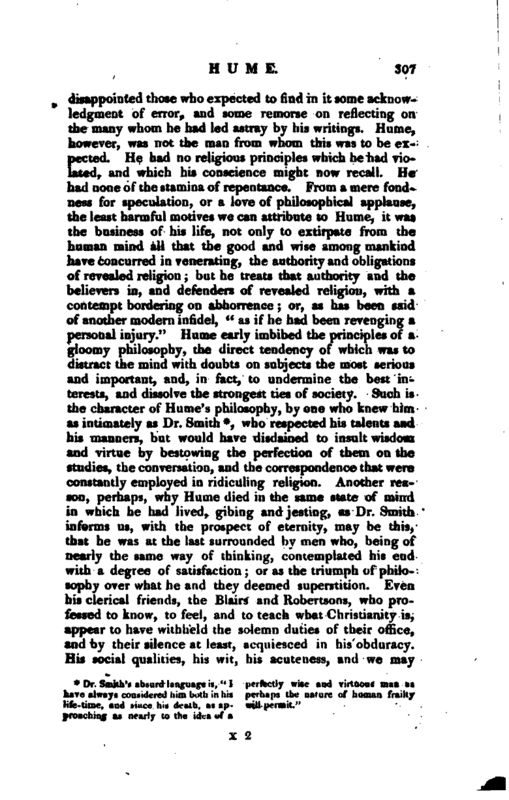 The scepticism and irreligion of Voltaire, Diderot, and Rousseau, “grew with their growth, and strengthened with their strength,” but Hume started as if from the nursery, a perfect and full-grown infidel. Having always imagined, that his want of success, in publishing the *‘ Treatise of Human Nature,“proceeded more from the manner than the matter, he cast the first part of that work anew, in the” Inquiry concerning Human Understanding,“which was published while he was at Turin; but with little more success. 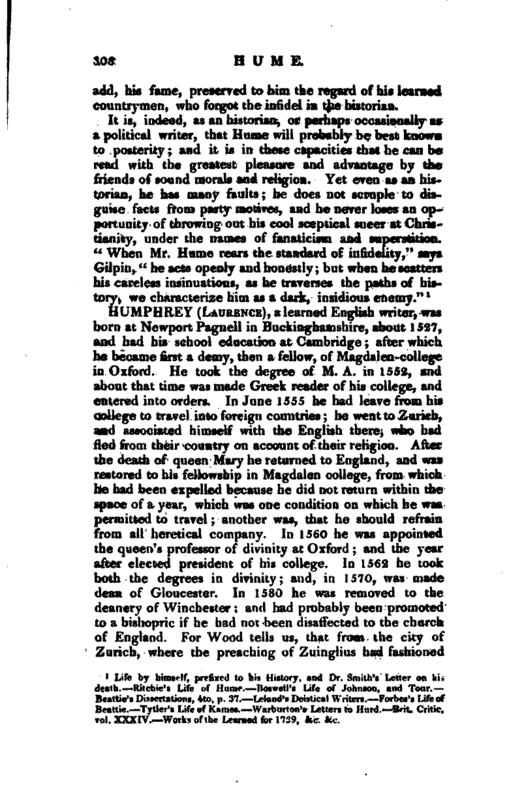 He perceived, however, some symptoms of a rising reputation: his books grew more and more the subject of conversation; and” I found,“says he,” by Dr. Warburton’s railing, that they were beginning to be esteemed in good company.“In 1752, were published at Edinburgh, where he then lived, | his” Political Discourses;“and the same year, at London* his” Inquiry concerning the Principles of Morals.“Of the former he says,” that it was the only work of his which was successful on the first publication, being well received abroad and at home:“and he pronounces the latter to be,” in his own opinion, of all his writings, historical, philosophical, or literary, incomparably the best; although it came unnoticed and unobserved into the world." 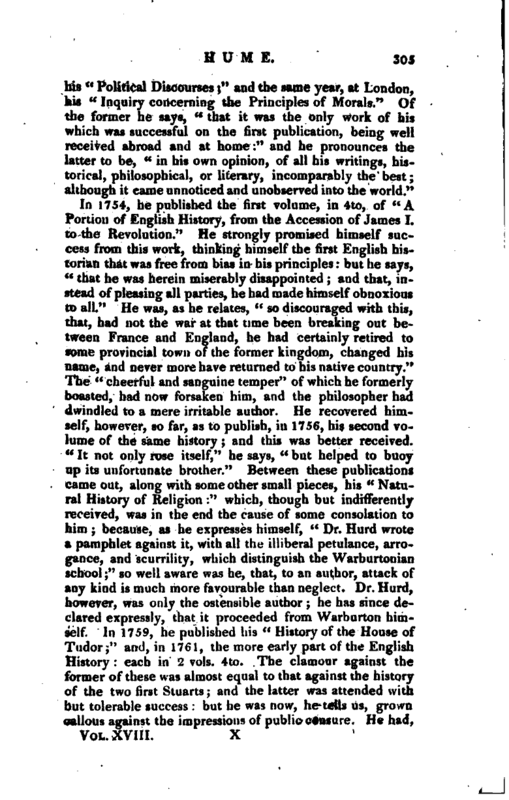 In 1754, he published the first volume, in 4to, of “A Portion of English History, from the Accession of James I. to the Revolution.” He strongly promised himself success from this work, thinking himself the first English historian that was free from bias in his principles: but he says, “that he was herein miserably disappointed and that, instead of pleasing all parties, he had made himself obnoxious to all.” He was, as he relates, “so discouraged with this, that, had not the war at that time been breaking out between France and England, he had certainly retired to some provincial town of the former kingdom, changed his name, and never more have returned to his native country.” The “cheerful and sanguine temper” of which he formerly boasted, had now forsaken him, and the philosopher had dwindled to a mere irritable author. He recovered himself, however, so far, as to publish, in 1756, his second volume of the same history and this was better received. 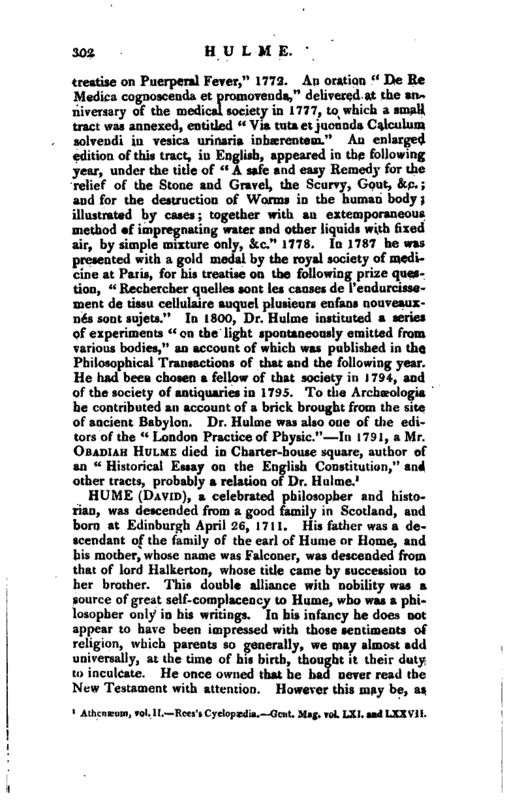 “It not only rose itself,” he says, “but helped to buoy up its unfortunate brother.” Between these publications came out, along with some other small pieces, his “Natural History of Religion:” which, though but indifferently received, was in the end the cause of some consolation to him; because, as he expresses himself, “Dr. Hurd wrote a pamphlet against it, with all the illiberal petulance, arrogance, and scurrility, which distinguish the Warburtonian school;” so well aware was he, that, to an author, attack of any kind is much more favourable than neglect. Dr. Hurd, however, was only the ostensible author; he has since declared expressly, that it proceeded from Warburton himself. In 1759, he published his “History of the House of Tudor;” and, in 1761, the more early part of the English History: each in 2 vols. 4to. The clamour against the former of these was almost equal to that against the history of th two first Stuarts; and the latter was attended with but tolerable success: but he was now, he tells us, grown callous against the impressions of public censure. He had, | indeed, what he would think good reason to be so; for the copy-money given by the booksellers for his history, exceptionable as it was deemed, had made him not only independent, but opulent. who respected his talents and his manners, but would have disdained to insult wisdom and virtue by bestowing the perfection of them on the studies, the conversation, and the correspondence that were constantly employed in ridiculing religion. 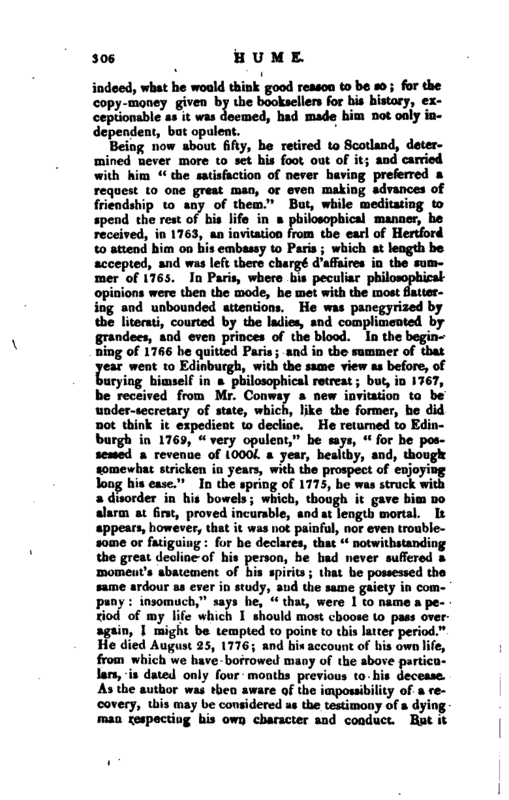 Another reason, perhaps, why Hume died in the same state of mind in which he had lived, gibing and jesting, as Dr. Smith informs us, with the prospect of eternity, may be this, that he was at the last surrounded by men who, being of nearly the same way of thinking, contemplated his end with a degree of satisfaction or as the triumph of philosophy over what he and they deemed superstition. Even his clerical friends, the Blairs and Robertsons, who professed to know, to feel, aud to teach what Christianity is, appear to have withheld the solemn duties of their office, and by their silence at least, acquiesced in his obduracy. His social qualities, his wit, his acuteness, and we may | add, his fame, preserved to him the regard of his learned countrymen, who forgot the infidel in the historian. 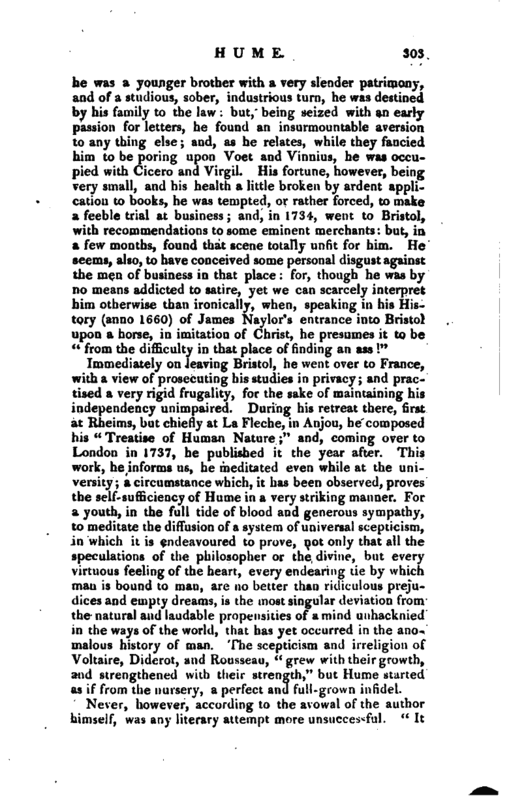 Life by himself, prefixed to hi* History, ad Dr. Smith’s Letter on his death. Ritchie’s Life of Hume. 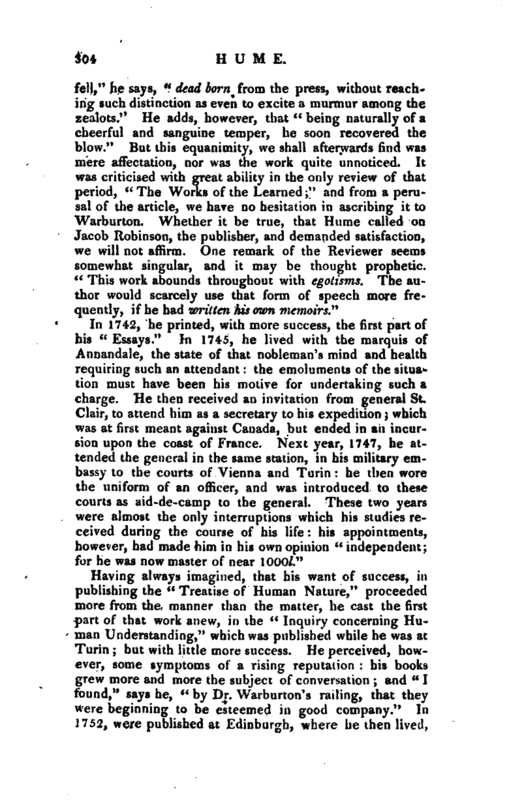 Boswell’s Life of" Johnson, and Tour. Beattie’s Dissertations, 4to, p. 57. —Leland’ Deistical Writers. Forties’s Life of Beattie. Tytler’s Life of Kames. -Warburton’s Letters to Hurcl. Brit. Critic, vol. XXXIV. —Works of the Learned for 1729, &c. &c.